24 weeks is a big milestone in pregnancy. It’s the start of the last month of the second trimester, but it’s more than that: it’s a critical juncture because, although a baby born at this stage would surely need a great deal of medical intervention and care (and would need to spend several months in the NICU) … a baby is considered “viable” — meaning that its chances of surviving outside the womb after this point (with great care) are good. I know it seems morbid to think about these things, but I’d be lying if I said I didn’t consider them in my mind. I’ve been on [self-imposed] high-alert this whole pregnancy and doubt that I’ll ever be able to truly relax, but I do feel a sense of relief each week that passes (though I do hope he stays comfortably put til week 39!). On to happier things, I’m feeling really, really good. I’m still keeping up with my workout regimen and though I’ve had to modify some moves in Body Pump and Zumba, I know how good it is for me — and baby — to keep it up. I am much bigger than I was with Maya at this stage, and I wonder how big this little boy will be … or maybe it’s just too many M&Ms and too much cheese showing up 😉 Either way, I feel good and that’s what counts. Along those lines, I’m now up 18.4 lbs from my pre-pregnancy weight, which feels like a ton (healthy total pregnancy weight gain for an average-sized woman is 25-35 lbs and for me, 25 is probably what I ought to gain, being a little overweight pre-pregnancy)… but I also know the “why” and that helps a lot. It’s for a good cause, and that’s what I remind myself of when I start to feel anxious about it. I don’t know how long I’ll be able to pump iron — but I figure, while I feel good and strong, I might as well keep at it. At the very least, I’m working my muscles and building up bone density, right?? I remember also doing a serious exhale at the 24 week mark. It is a huge relief to hit that point. Yes! Such a relief. Still a ways to go … but more weeks behind than ahead! LOL … we only lay on them for chest and triceps (don’t use them as steps for this class). Thanks! 🙂 LOL … AWW! 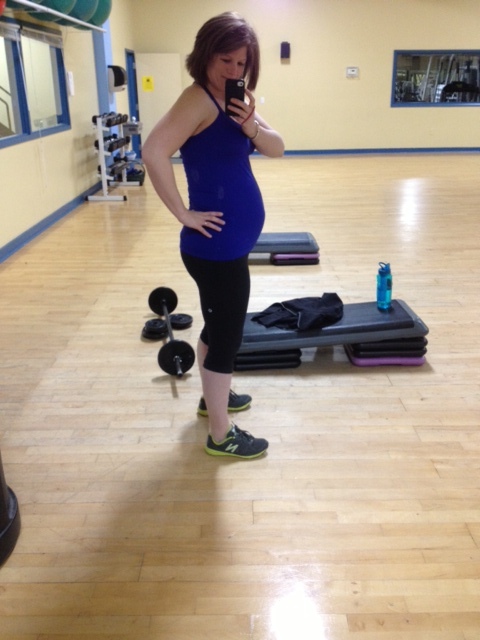 Way to go for keeping up with workouts during pregnancy!